In traditional Jewish weddings, the marriage ring has to be completely round, made of gold with no embellishments. No diamonds or stones; just a plain gold ring. When my maternal grandparents were married in 1925, they used such a plain white gold ring to ensure a blissful life. Both from Europe, they had no parents to be with them when they married. But they followed the traditions. First they got permission from my great grandfather. Then they married. My grandfather said the traditional words, “With this ring, you are consecrated to me according to the law of Moses and Israel,” when he placed the ring on my grandmother’s forefinger. The ring adorned my grandmother’s hand for the first 26 years they were married. But in 1951 my mother and father married. My Dad was in the army and was being sent to Korea. My grandparents were not exactly happy about my Mom getting married while Dad was on leave. They were worried. Would he survive? Would everything be okay? 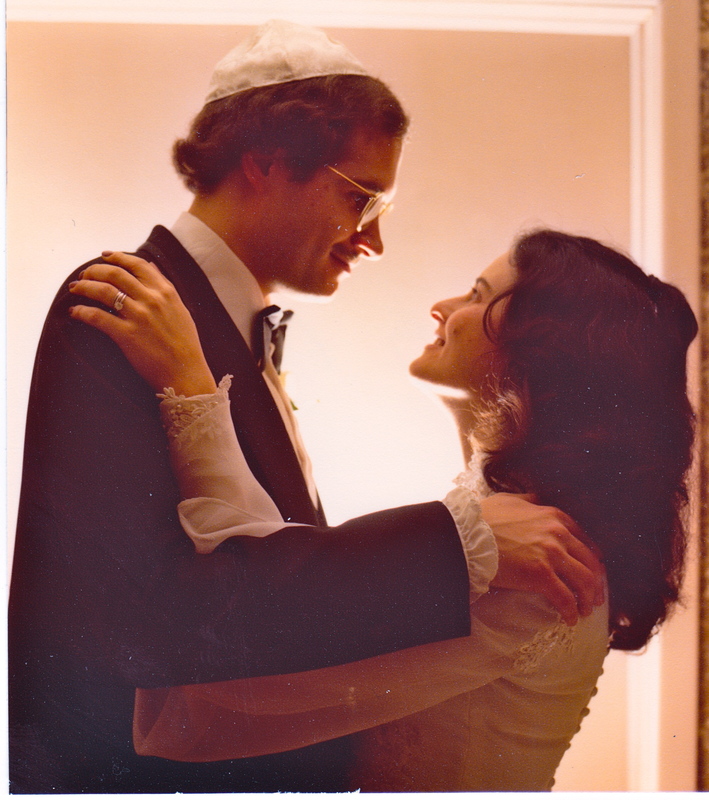 My parents got married while my Dad was on a two-week leave. They did not have time to find and buy a ring. So my grandparents decided that my Mom would get married using their ring. My father paid my grandmother for the ring, as it cannot be borrowed. It must belong to the groom. Thus my parents were married using my grandmother’s wedding band. 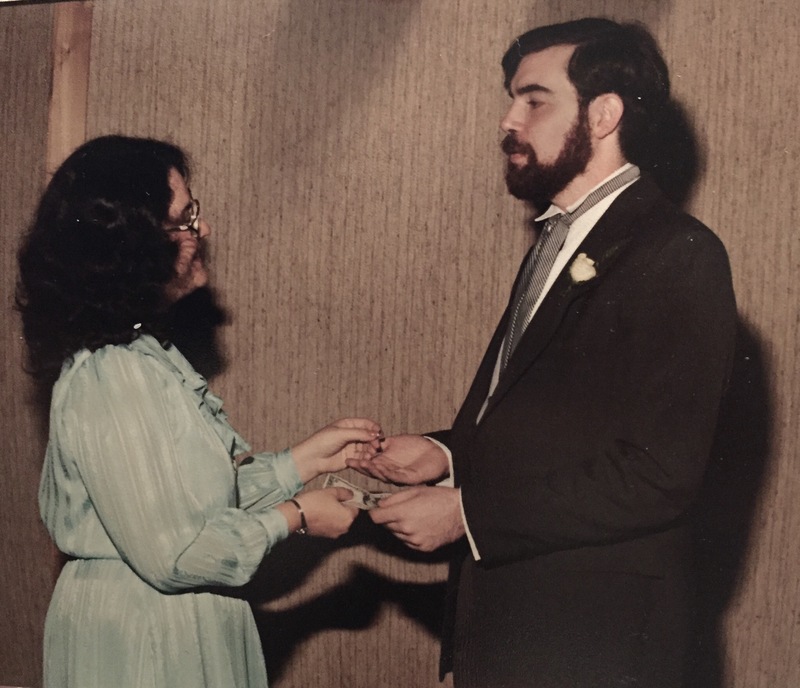 Once again the traditional marriage words were said, “With this ring, you are consecrated to me according to the law of Moses and Israel.” My parents were now bound together. My grandparents were married for over 60 years. My parents were married 59 years before my Mom passed away. Mom made sure that the tradition continued. She felt that since the ring had been a vital part of two wonderful weddings and marriages, then it would bring mazel to others as well. She decided that her daughters would also have to be married using this ring. Notice the two gold rings by my engagement ring, several hours after my husband and I were married. When I married in 1980, I also was married in this special ring. My husband paid my mother one dollar for it. And even though I had another plain gold ring to wear, during the service it was my grandmother’s and mother’s ring that was placed on my right forefinger, and later moved to my ring finger. My husband recited the same words to me, “With this ring, you are consecrated to me according to the law of Moses and Israel.” And I, being a more modern bride, wanted to say something as I placed a ring on my husband’s finger. So I said, “My beloved is mine and I am my beloved. Ani le’dodi v’dodi li.” I wore the family ring, along with my gold ring, for several years until my sister was to be married. Selling the ring to my brother in law just before he married my sister. And then, as my mother wished, my sister’s groom purchased the ring for one dollar from my husband and me. Once again the ring was placed on the forefinger of a family bride. As grandchildren were born into the family, my mother asked that the ring be used for each granddaughter’s wedding. And of course we agreed. My sister and I also feel that the ring should be used for the grandsons’ weddings as well, if they want to use it. My grandmother’s ring and the dollar bills each groom paid for the ring: my Dad, my husband, my brother-in-law. The ring is now in my sister’s safety deposit box waiting for the next family wedding. With the ring are the dollar bills that my Dad, my husband and my brother-in-law all used to pay for the ring. Each dollar bill has the name of the bride and groom and the date of the wedding written on it. They are part of the tradition of the ring. Soon the ring will come out of its resting place. It will be time to adorn the finger of another bride. I am happy that it will be my daughter’s wedding. The oldest grandchild, my daughter and her boyfriend recently announced their engagement. They plan to wed next summer, in 2016. I hope that her groom will want to buy this ring to use for their marriage ceremony. So that for the fourth generation, 91 years after my grandparent’s wedding, this magical ring will be used again. I cannot wait to see my daughter and her groom stand under the huppah together. I hope that they will use my father’s tallit for this special day. I cannot wait to see my grandmother’s white gold wedding ring slide onto the forefinger of my daughter. I cannot wait to hear the traditional words spoken by the groom. I wonder if my daughter will respond as I did, or in the way more modern brides do repeating the same words that the groom says to his bride. I only hope that the magic of the ring continues and that my daughter and her groom celebrate throughout their married life with the joy of marriage that went through the lives of all the brides who have worn it.